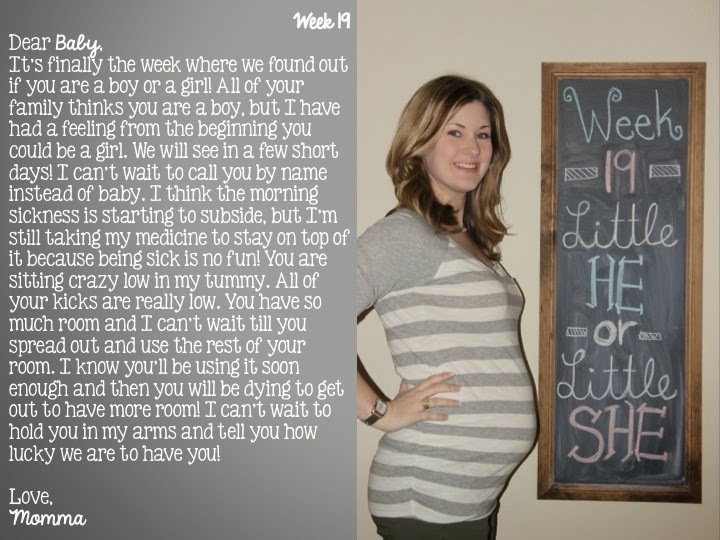 week 19- bump update and letters for baby - The Mrs. & Co.
Maternity clothes? FULL on maternity clothes now. My bump is so low that my regular shirts are becoming too short! Thank goodness the hubs started budgeting for maternity clothes for each month. Sleep: Turning over has become more of a problem. I can't get enough pillows so I invested in the Snoogle. It has been the best investment ever! Best moment this week: Finding out if baby will be a little he or little she on Friday! Miss anything? I will always miss wine and sushi. Two things Kyle and I love to go out and get on the weekends. It's kind of our thing. Food cravings: Craving Chick-fila constantly! I could eat it for every meal! Anything making you queasy or sick? stinky people. Seriously. The gym makes it hard, but I try to continue going even when I want to gag. Gender: This Friday is our appointment with our gender reveal party on Saturday. Symptoms: The symptoms have started to level out and I am thankful for that. The nightly peeing is a constant of course. Belly button in or out? In! And I don't think it will ever pop. It's the deepest inney ever! Happy or moody most of the time: I am happy! ALL the time! Looking forward to: Our cruise in 2 weeks and of course finding out if Baby Sanderson is a girl or boy! I can't wait to call him/her by name!! Cruise! Yes! SO SO SO fun! Can't wait to hear how it goes! Lucky for you, a glass of wine is good while breastfeeding ;) Can't wait to find out the gender!! I randomly found your blog awhile ago while I was going through IVF.. just wanted to say so glad to see your bump! I am so glad you commented! I am now following your blog. I just sat and read through your story and I have to say you are one of the strongest women I know! I have a friend who gave birth to her triplets at 19 and 20 weeks in November. You and her are my heroes. We have experienced loss before this pregnancy and I could barely handle that pain. I know your pain was so much more and I am so proud that you can write about it and start to heal. I hope our babies meet in Heaven and God can sit them in His lap and teach them all about their brave, loving mommas that they will meet one day. Thank you so much for your kind words. I know that because we do not get a chance to tell our little ones about God, He is telling our babies about you and I. I can't wait until you can post pictures of your beautiful baby that is on the way! Read this post if you want to know what are the best nursing schools at your area. This will help you to collect and analyze an info about educational establishments.